For other places with the same name, see St Andrews (disambiguation). The Royal Burgh of St Andrews  is a small town (population 18,000) in the kingdom of Fife on the east coast of Scotland, facing the North Sea, and hosting the oldest university in Scotland. The town is perhaps most famous, however, as the home of golf. The University grew up out of the cathedral, and was founded in 1410, being the oldest university in Scotland, and the third oldest university in the English-speaking world. Today, the University dominates the town, particularly during termtime. The university is often seen as being quite elite, and was the place of education of Prince William, second in line to the British throne. St Andrews is also seen as the Home of Golf, being the home of the Royal and Ancient , one of the oldest Golf Clubs in the world and the R&A  one of game's worldwide ruling bodies. There are a large number of golf courses or links, as coastal courses are properly known. The most famous golf course in the world, the Old Course is in St Andrews. It hosts the Dunhill Cup each October and, more importantly, the Open Championship every five years with the next scheduled Open to be held in 2021. The nearest major international airport to St Andrews is at Edinburgh - 51 mi (83km), approximately 60 minutes from St Andrews by train or car. Buses run directly from Edinburgh to St Andrews. Although St. Andrews does not have its own train station, you can disembark in the nearby town of Leuchars and take a bus or taxi to St. Andrews. Flights to London are also available from nearby Dundee Airport - 14 mi (23km). The nearest train station is at Leuchars, about 10km away. It is served by trains from Edinburgh and Dundee / Aberdeen. There are some direct trains from London Kings Cross. Buses to St Andrews connect with the train at Leuchars, combined tickets (RailBus) are available . The bus fare from Leuchars to St. Andrews is £3.20. Taxi service is available at Leuchars and it will cost about 15 pounds to reach the city centre. Wikitravel has a guide to Rail travel in the United Kingdom. Stagecoach Fife  operate buses to St Andrews. Take bus 99 or 96 from Dundee cost £5. The town is small enough that it is simplest to walk. Taxis are also available (taxi ranks are located on a street connecting Market Street to South Street called Bell Street, outside Holy Trinity Church on South Street and also at the bus station). Bus services link some of the outlying areas, operated by Stagecoach Fife . There is a Park & Ride scheme, where visitors can leave their cars outside of the town in a large carpark, and take a bus into the town centre, though it is easier to walk the 200 metres or so from the outlying carpark to the high street. It is very difficult, and expensive, to park in the town. A pay & display system operates in the town centre - machines are located along the street, or RingGo can be used to pay by credit/debit card. There is also a complex one-way system, resulting in it taking longer to drive from one part of the town centre to another than it would to walk. University of St. Andrews--The University of St. Andrews  was founded in 1413 and is the oldest university in Scotland. Today it is a bustling university of approximately 7,000 students, with its most famous recent alumnus being Prince William, who studied art history at the university from 2001 to 2005. Its campus, which is spread throughout downtown St. Andrews, features many interesting historical buildings, including the 16th Century St. Salvator's Chapel. St Salvator's Quad, North Street (behind St Salvator's Chapel), . Open daily. This is the historic Quadrangle of St Salvator's College of the University and teaching still takes place in the college buildings. St Salvator's Chapel is used for University services every Sunday, and visitors will see staff and students in the traditional university dress (red gowns for undergraduate students of the United College). After chapel, students walk down to the end of the pier in the traditional Pier Walk. On North Street, just outside St Salvator's Quad, visitors will see the letters PH in the cobbles. This is the site where the martyr Patrick Hamilton was burned at the stake, and it is considered bad luck to walk on the letters: it is said that students who walk across these letters will fail their degree but can remove the 'curse' by bathing in the sea at dawn on 1st May (The May Dip). St Mary's Quad, South Street (enter through black iron gate with words "In Principio Erat Verbum"), . Open daily. This is the historic quadrangle of St Mary's College, University of St Andrews (founded 1410). On entering the quadrangle from South Street, St Mary's College is on the right - now houses the university's Faculty of Divinity. On the left of the gate is Lower Parliament Hall which was temporarily the site of the Scottish Parliament during an outbreak of plague in Edinburgh from 1645-6, and is now used as the University Debating Hall. The building on the left of the Quadrangle is now the School of Psychology, but was formerly the University Library (which was a copyright library 1710-1837). The tree on the right hand side of the Quadrangle was planted by Mary Queen of Scots. This is commonly mistaken for the large oak tree present in the centre of the Quadrangle. On the far side of the Quadrangle is the ruined remains of a gate, now being restored, and beyond that lies the Bute Medical School, dating from 1899. Information panels in the Quadrangle give visitors historical information. St Andrews Botanic Garden, Canongate, St Andrews KY16 8RT, +44 1334 476452 ([email protected]), . Daily, Apr-Sept, 10.00-18.00; Oct-Mar, 10.00-16.00. Originally founded as the University Botanic Gardens in 1889, now run by St Andrews Botanic Garden Trustl. Beautiful landscaped gardens, with different conditions (water garden, heath garden, peat garden, rock garden, Chinese garden, Chile garden). Eight beautiful glass houses with orchids, cacti alpine and tropical plants. £5 (Under 18; Students; Friends of Botanic Garden FREE). St Andrews Preservation Trust Museum and Gardens, 12-16 North Street, St Andrews, +44 1334 477152 ([email protected]), . Daily, 2PM-5PM. Museum about the history of St Andrews. Displays feature old shops, furniture, art, etc relating to local area, gardens, and souvenir shop. Free, but donations welcomed. British Golf Museum, Bruce Embankment, +44 1334 460046, . Easter-Oct, M-Sa 9.30-5.30, Sun 10-5; Oct-Easter, 10AM-4PM M-Su. Located near the Royal and Ancient Golf Clubhouse, this museum offers an interesting look at golf through the ages. £5 (£4 Senior Citizens & Students; £2.75 children 5-15; FREE children under 5). Aquarium, The Scores, St Andrews KY16 9AS, +44 1334 474786 ([email protected]; Fax +44 1334 475985), . Aquarium with seals, fish, reptiles, etc. The seemingly diminutive exterior hides a fairly extensive complex. £6.20 (Child £4.40; OAP £5.00; Student £5.20). St Andrews Museum, Kinburn Park, Doubledykes Road, St Andrews KY16 9DP (located in middle of Kinnburn Park), +44 1334 412690, . Museum about the history of St Andrews. Also regular temporary exhibitions on various subjects. St Andrews Castle, St Andrews (near Cathedral), +44 1334 477196, . April-Sept, M-Su, 9.30AM-6.30PM; Oct-March, M-Su, 9.30AM-4.30PM. St Andrews Castle, built in approximately 1400, is where the Bishops of St Andrews lived before the Reformation. It has also served as a fortress and even a prison, but fell into ruin in the 17th century. It has a beautiful location next to the sea. See and explore the mine and counter-mine built under the Castle during a siege in the 1540s. £4.50 (Child £2.00, Concessions £3.50, joint Castle & Cathedral ticket available). St Andrews Cathedral and St Rule's Tower, North Street, St Andrews, +44 1334 472563, . April-Sept, M-Su, 9.30AM-6.30PM; Oct-March, M-Su, 9.30AM-4.30PM. Ruined Cathedral. St Andrews was the Ecclesiastical Capital of Scotland before the reformation, and St Andrews Cathedral was the most important cathedral in Scotland. Constructed between 1160 and 1318, it was consecrated in the presence of the legendary Robert the Bruce. However, the cathedral fell into disuse in the 1550's, following the Reformation, and many of its stones were removed in the 17th century to construct other buildings in the town. Its picturesque outline remains, however, including stunning towers. Museum tells of the history of the cathedral, and has mediaeval sculpture and artefacts from the site. Cathedral ruins can be explored, and panels explain history. St Rule's Tower, a remnant of the church that predated the cathedral, can be climbed and provides stunning views over St Andrews and the surrounding area. The grounds are free of charge to the wandering tourist. To go up St Rule's Tower costs £3.50 (Child £1.50 Concessions £2.50). Pier and Harbour, St Andrews (Walk down The Pends to the harbour/pier area), Pier and harbour, have survived from St Andrews fishing industry history. This is a pretty place to walk to on a summer's day, with views from the end of the pier of the whole of St Andrews Bay and across the mouth of the Tay to the mountains of Angus. On Sundays, staff and students walk to the pier in their traditional academic dress at the end of chapel. West Sands (beach), One of St Andrews' three beaches, it is the largest, accessible from The Scores. There are large dunes (not accessible to the public) and a large expanse of sand. Several scenes from the film Chariots of Fire were filmed on this beach. East Sands (beach), Accessible from The Scores. This is a smaller and more sheltered beach than West Sands. It is the site of the annual May Dip, where students jump into the sea at daybreak on May 1st as part of an ancient university tradition. Castle Sands (beach), This is the smallest of St Andrews' beaches, located below the castle. This used to be the site of May Dip, before it was restricted by the university to East Sands only. Byre Theatre, Abbey Street KY16 9LA, +44 1334 475000 (Fax: +44 1334 475370), . Professional theatre, variety of repertory productions on. Also some touring productions and some good amateur productions. Also has a cafe-bar. Crawford Arts Centre, 93 North Street, KY16 9AD (near New Picture House cinema; opposite police station), +44 1334 474610 ([email protected]line.co.uk; Fax +44 1334 479880), . M-Sa, 10AM-5PM; Sun 2-5PM. Arts Centre with crafts, exhibitions and performances. FREE for exhibitions (extra price for performances, varies with performance). New Picture House(Cinema), North Street, St Andrews, +44 1334 474902 ([email protected]), . Open daily, depends on film. Independent cinema, varied selection of films, from new releases to some alternative/independent/foreign language films (especially during termtime). Late night showing on Wednesday night during university termtime (usually old/cult film). £4.20 (£5.20 for Circle in Auditorium 1; £3.20 Child; £3.50 Senior Citizen). The Isle Of May, 01333 310103, . 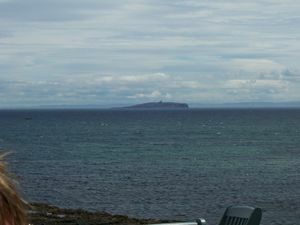 Small island lying in the entrance to the Firth of Forth, approximately 5 miles off the Fife coast. National Nature Reserve owned and managed by Scottish National Heritage. Boat trips on the 'May Princess' leave once a day (except some weekdays in April and May) from Anstruther's middle pier from April to 31st of September. Seals can be seen all year round, whales can be spotted in late July and August. Notable for its many seabirds, especially puffins, which can be seen in their thousands from April to July and are the island's main attraction. Tickets can be purchased from the small kiosk on the pier from which the boat leaves. Adults £16, children (3-16 years) £8. Note that sailings can be cancelled at short notice depending on the weather conditions. Walk the golf course. The game of golf had its beginnings in this little Scottish town and even non-golfers should consider a stroll along the perimeter of the very first golf course, the old course. Watch out for flying balls, except on Sunday when the old course is closed and anyone can walk on its fairways. Located on the edge of the course is the imposing Royal and Ancient Golf Clubhouse . If you're lucky, you may spot one of the celebrities who occasionally visit to play the famous course (including not just Tiger Woods but amateur golfers such as Michael Douglas and Samuel L. Jackson). Play a round of golf, Playing St. Andrews' Old Course can be a difficult accomplishment, often involving exorbitant greens fees and a long waiting list. Golf enthusiasts may wish to contact The Royal and Ancient Golf Club well in advance. As an alternative, consider a round on one of St. Andrews' many other courses - ask at the tourist information office for more information. Stroll along the beaches, Yes, St. Andrews has three beaches (see above), but don't break out your swimming gear. Only the most brave or most foolish would attempt to dip in the frigid North Sea, particularly given Scotland's chilly clime (though this doesn't deter the annual "May Dip"!) The beaches are pleasant, however, and provide a nice view of the town. Golf souvenirs, accessories, and equipment can be purchased in many shops around the town, with several specialist shops near to the Old Course, including the prestige outlets within the Old Course Hotel's shopping arcade. Numerous tourist-friendly shops line Market Street, South Street, North Street, and The Links in central St Andrews. Shops primarily feature golf paraphernalia, Scottish souvenirs, and wool products. There are a number of high-street stores in St. Andrews, including Monsoon, Waterstones, H&M, New Look, Boots and others, all of which are primarily located on Market Street. If in need of staple items, a Tesco can be found on Market Street. University of St Andrews merchandise, including clothing, can be bought from the University Shop which is situated at the front of the Students' Union on St Mary's Place. The town has five supermarkets; the fairly small and busy 'Tesco Metro' and 'Sainsburys', both situated on Market Street, and 'Morrisons' 'Aldi' and 'M&S', situated further out of the town at the end of Largo Road. There is a butcher's shop on Bell Street and a greengrocer on South Street (West Port end), a fishmonger is found in The Tailend restaurant on Market Street, a bakery and confectioner on Church Street (between Market and South Streets)--the famous 'Fisher and Donaldson' (fudge doughnuts are a speciality). Market Street has a health food shop. If you have the opportunity, indulge in "chips and cheese" from one of the small fish and chip shops. You will find yourself enjoying steak fries smothered in salt, vinegar, and melted cheese, the perfect snack if you've just emerged from one of the nearby pubs. The Road Hole Grill, The Old Course Hotel, Old Station Road (overlooking the golf courses), +44 1334 474371, . Open daily 7-10PM. Located on the top floor with fine views over the golf courses, West Sands and North Sea. 3 AA rosettes. Excellent meat, game and seafood dishes. Open kitchen. Excellent and attentive service. Extensive (and expensive) wine list. Very pricy. number forty, The Golf Hotel, 40 The Scores, +44 1334 472611, . Nicely decorated, has sea views, good service. 2 AA rosettes. £25-30 for 3 courses. Excellent seafood and game. St Andrews features several quaint pubs, many of which are taken over by university students in the evenings during the academic year. Pubs worth buying a pint in include Ma Bell's, The Criterion, The Oak Rooms, The Raisin, The Lizard Lounge, The West Port, and The Victoria ("the Vic"). The Central, 77 Market Street, +44 1334 478296. Daily. Pleasant pub in centre of St Andrews. Bar located in centre of pub. Serves good range of beers and ales. Tables outside pub. Sports shown on small television in corner, but many people don’t watch it. Range of cheap but good quality food. Popular with both students and locals. Aikman's Bar and Bistro, Bell Street, +44 1334477425. More a proper 'pub' than a bar. Has many fine European beers and ales. Serves food till late. Friendly barmen are up for banter and always ready to recommend a drink to suit your tastes. Downstairs is the Cellar Bar, open every evening, a cosy area where you'll find each week's selection of real ales. Most Tuesdays in the Cellar is 'session' night, where a small live group plays traditional Scottish music. Pub quizzes are also hosted here. Live music upstairs every Friday. Criterion, 99 South Street, +44 1334 474543. The Criterion is the quintessential scottish pub serving an ever changing selection of local and far flung cask ales, over 50 malt whiskies, premium gins, bourbon, vodka and rums. Open from 10am every day of the week. Food is served from 10am to 8pm with the house speciality being the traditional stovies or the world famous Cri Pie!! Monday night is Open Mic Night, Thursday is live music with Black Sheep Band and Sunday is Quiz Night. Free WIFI, all live sports shown and the best coffee in town! St Andrews Brewing Company, 177 South St, +44 1334 471111. St Andrews Brewing Company has been brewing since 2012 and had a bar/pub since 2013. Their 16 taps (8 beer engine, 8 CO2 forced) have many different styles available and often include guest beers from other breweries. There are many cosy nooks, with a few fire places and couches. Also have free WiFi and offer food. The Lizard, Underneath The Oak Rooms, North Street. The closest thing St Andrews has to a club. Gets very busy on Friday and Saturday -people even dance! DJs Friday & Sat, Live Music on Mondays. There are many Bed and Breakfasts and Guest Houses in St Andrews, most of which are centrally located--the majority of these in Murray Park and Murray Place. Prices are generally in the £25-35 range per person per night. St Andrews Tourist Hostel, Inchcape House, St Marys Place (Opposite Students' Association, above Grill House Mexican restaurant), +44 1334 479911 (fax +44 1334 479988) In centre of St Andrews, close to bus station. Kitchen, laundry, free linen, showers. £12-£16. St Andrews Youth Hostel (David Russell). Modern apartments with 5 double ensuite bedrooms and a kitchen/living area per apartment, situated roughly a mile from the town centre. This is student accommodation most of the year, so is only open to the public in July and August. Office hours are 8AM-10AM and 4PM-10PM. The office/Youth Hostel reception is situated in a small room to the left as you enter the main facilities building, not at the Reception to the right. Bistro on site and also a bar. Games room and laundry facilities also available. More expensive than the Tourist Hostel. Aslar House, 120 North St, +44 1334 473460. Bed and breakfast accommodation within the heart of St. Andrews medieval town. Quietly refined with modern amenities, Aslar's period style accommodation provides guests with a chance to relax, unwind and take advantage of everything St. Andrews and the East Neuk has to offer--with a fantastic breakfast and superb hosts with unlimited local knowledge. Prices start at £45 for a single room through £96 for a double room per night, with many options in between. Albany Hotel, 56-58 North St, +44 1334 477737. Peacefully situated in the heart of historic St. Andrews this elegant Georgian terraced house dates from 1795. Prices start at £80 for a single and £130 for a double room per night. Yorkston Guest House, 68- 70 Argyle Street, +44 1334 472019, . Situated in the west end of St. Andrews, a few minutes walk from the west port and town centre. Bed and breakfast from £45 per person per night. Pitmilly West Lodge Kingsbarns. Although situated about 4 miles from the centre of St Andrews, this guest-house is in a wonderful location and anyone who has ever stayed there praises the owners for their hospitality, their wealth of local knowledge and not least the quality of the cooked breakfast! The decor in this upmarket B&B is of the very highest standard. Rooms start at £38 pp/pn. Old Course Hotel, Old Station Road, . Golf Resort and Spa overlooking the town golf courses and the North Sea. 109 rooms, 35 suites--according to the website, all rooms boast bathrobes, iron and ironing board, slippers, wireless connectivity, mini-bar, direct dial telephone, tea and coffee making facilities, voicemail, hairdryer, CD player, toiletries and best water pressure in the United Kingdom. Expect to pay at least £280 per room per night. Golf Hotel, 40 The Scores, . Views over St Andrews Bay. Suites with up to 4 bedrooms available. Bed and Breakfast from £100 per person per night (£15 for a child sharing a room with 3 adults, £50 for an extra adult sharing a room with 2 adults). Parts of the hotel recently refurbished. Fairmont St Andrews, +44 1334 837000. Originally opened as the St Andrews Bay Resort & Spa, this magnificent hotel complex sits on the summit of a spectacular formation, the hotel and its two stunning golf courses have breathtaking panoramic views of the Eden estuary and the medieval skyline of St Andrews. Expect to pay at least £160 per room per night. St Andrews is one of the safest places in the world, with practically a non-existent crime rate. General caution, however, applies, as it does anywhere. There are internet facilities inside Costa Coffee (Market Street, opposite the fountain), however, if you have your own laptop, there are wireless facilities in Starbucks (also Market Street) as well. Many of the independent cafes offer free wi-fi with every purchase: Beanscene, The Byre Bistro, The Rule, The Westport, and Zest Juicing to name but a few. Most of these are found on South Street. Alternatively go to the town's library on Logies Lane with a form of identification (passport, driver's license etc) and you can use their computers for free. St Andrews is over run with payphones, which take coins and cards (and you can also surf the web in some). They're the cheapest way to call other landlines in the UK (unless you have access to a private number). There is a municipal gym in the East Sands Leisure Centre (off the east sands) which also has a swimming pool. For the more deluxe option, you can indulge yourself at the Old Course or Fairmont St Andrews hotels. University students tend to patronise the University Sports Centre on the North Haugh. St Andrews is close to the larger cities of Dundee and Edinburgh. A visit to the nearby Isle of May is highly recommended, as is a trip along the East Neuk to visit the picturesque fishing villages of Crail, Anstruther, Pittenweem, St Monans and Elie. This page was last edited on 6 January 2019, at 13:11.